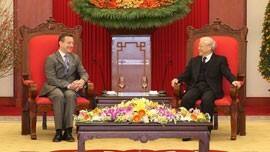 “We, our companies surely, but also the French Government, are pleased to observe Vietnam’s commitment to design a modern and more business-friendly environment,” said French Ambassador to Vietnam Bertrand Lortholary when asked about improvement in Vietnam business environment in recent years. “The Vietnamese government’s anticipated efforts to instil a business-friendly environment in Vietnam are to be praised: they have already contributed to several success stories of ours,” he added. Lan Anh reports. Vietnam and France are celebrating the 45th anniversary of diplomatic establishment in 2018. Could you please tell us about some economic and cultural exchanges between the two countries to commemorate this event? 2018 is considered a very significant year regarding the relationship between Vietnam and France. We celebrate indeed both the 45th anniversary of diplomatic establishment and the 5th anniversary of the strategic partnership. We will conduct major and iconic projects in different fields so as to commemorate these events, especially in the economic and cultural sectors. In the cultural field, about 40 events will bear the logo of the 45th anniversary, taking place in Hanoi, Ho Chi Minh City but also in other main Vietnamese cities such as Vinh, Can Tho, Nha Trang, Hue etc. One of the most notable events will certainly be the presentation of the theater play Saigon in Ho Chi Minh City in September. Saigon, a French-Vietnamese co-production, was written by the playwright Caroline Guiela Nguyen while she was artist-in-residence at the Villa Saigon, a residence that is part of the French cultural institute in Ho Chi Minh City. The play was a key feature of last year’s Avignon theater festival and is currently being played with all dates sold out in advance. Other main remarkable events include a live outdoor rock concert at the sport stadium during the Hue International Festival in April, a presentation in Ho Chi Minh City of the opera Frédégonde composed by 19th-century composer Camille Saint-Saens while he was residing in Indochina, a street-art performance troupe “Be Clown” that will tour several cities in April and May… To conclude, let’s also mention the concert of the Vietnamese singer Le Cat Trong Ly, whom the French Institute is proud to support since the start of her career. Regarding economic exchanges, the fifth reunion of the High Level Economic Dialogue took place in January 2018 in Hanoi. It was chaired by both Mr Nguyen The Phuong, Vice-Minister of Planning and Investment, and Mr Jean-Baptiste Lemoyne, Secretary of State. It was the occasion for them to assess the dynamic of commercial exchanges between the two countries, which have risen by 11.6 per cent in 2016, reaching €4.6 billion. They also emphasized the opportunities the free trade agreement between Vietnam and the European Union will generate, facilitating access to markets and intensifications of economic and commercial exchanges. Last but not least, the two officials mentioned the different Vietnamese projects France is involved in, such as the metro line Number 3 in Hanoi, which is iconic of the French-Vietnamese cooperation, but also other fields of strategic development (transports, energy, environment, etc). In recent years, many French business delegations have arrived in Vietnam to learn about the market and cooperation opportunities with Vietnamese enterprises. What would you say about the cooperation between the two countries in trade and investment? What are productive areas of cooperation for businesses of the two sides? Economic cooperation between Vietnam and France has historically been strong and is still developing. We work in close cooperation with Vietnamese actors on a set of diverse issues in order to improve our bilateral economic connection. His recent visit here in Vietnam was the opportunity for our Minister to re-affirm the importance of our economic cooperation. Our commercial relationship has been on an upward trend for the past few years. Our exports to Vietnam have indeed increased by +4.9 per cent in 2016, and by 15.1 per cent for the first 11 months of 2017. Aeronautic is a key sector for our exchanges, pharmaceuticals or agriculture being more and more important. Vietnam holds many promising opportunities for our companies, and I believe that French high-quality products will contribute to satisfy a rising and demanding middle class. On the other side of the equation, Vietnamese exports to France continuously rise (+10.6 per cent in 2016, +15.3 per cent for the first 11 months of 2017) and represent a promising market for national companies, especially in the manufacturing sector. The perspective of the European Union – Vietnam Free Trade Agreement (EVFTA) is a further source of hope for our commercial relationship. The upcoming reduction of trade barriers – be they tariff or non-tariff ones – will allow increasing exchanges between our two nations. In parallel, the Vietnamese government’s anticipated efforts to instil a business-friendly environment in Vietnam are to be praised: they have already contributed to several success stories of ours. I am thinking, especially, of the progressive arrival of French agricultural products on the Vietnamese market: its fruits, its vegetables or its meat. However, our relationship is insufficiently narrow when it comes to investments. French financial flows to Vietnam are considerably low compared to other European countries, when our technology and our savoir-faire could contribute perfectly to Vietnam’s double desire of economic performance and sustainability. This relationship will get tighter in the coming years, mainly through the benefits offered by the EVFTA. Yet, it belongs to both French and Vietnamese officials to advertise Vietnam’s economic dynamism: 6.8 per cent economic growth in 2017 and hopefully close again to 7 per cent in 2018. France and Vietnam must deepen their economic relationship, and reach the level of cooperation and trustworthiness that already exist in the political domain. The EVFTA is in this regard a catalyser. However, we believe that we need to push forward cooperation in different fields in the upcoming years, where France holds an internationally recognized expertise and know-how, and which can be adequately helping Vietnam’s development. Commodities, like cosmetics and agricultural and food products, are full of opportunities for French companies and Vietnamese consumers alike. The rising middle class indeed advocates for larger consumer choices, high quality and reliability; many considerations that our companies care about with attention. Health sector is also a key sector for us. Improving health infrastructure as well as access to treatment and medicines is a challenge here that our hospitals, laboratories, and pharmaceutical entities are willing to tackle. Then comes Vietnam’s sustainability and infrastructural future. Our development agency has participated alongside the French Ministry for the Economy and many French companies to build more connected cities, less vulnerable and more eco-friendly infrastructures. I can mention in this regard the metro projects in Hanoi and Ho Chi Minh City, the waste management projects in Ho Chi Minh City or the participation of French companies to Vietnam’s highways master plan. Vietnam has been working hard in the process of institutional reform to improve its investment climate to attract foreign investors, including those from France. Could you please tell us about this reform of Vietnam? We, our companies surely, but also the French Government, are pleased to observe Vietnam’s commitment to design a modern and more business-friendly environment. For instance, Vietnam has jumped 14 places to number 68 among 190 economies in terms of the ease of doing business this year, according to the latest rankings released by the World Bank. The Doing Business 2018 report shows that Vietnam, along with Indonesia, has implemented the most reforms in the past 15 years, with 39 reforms. Such a modern business environment will not only increase foreign presence on the Vietnamese soil. It will not only create higher exchanges between our two countries. It will also reinforce Vietnamese people’s prosperity, which will benefit from lower prices, more diverse products and larger business and partnership opportunities.